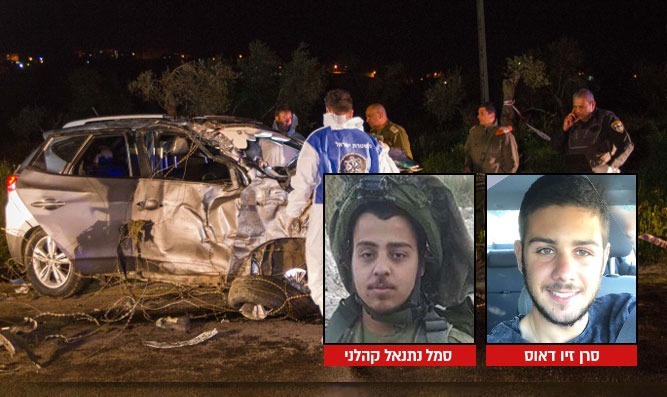 The two soldiers murdered in Friday's ramming attack are Captain Ziv Deus, 21, and Sergeant Netanel Kahalani, 20. Captain Ziv Deus, 21, from the Azor Regional Council, and Sergeant Netanal Kahalani, 20, from the town of Eliakim, were the two IDF soldiers murdered in Friday's ramming attack. The attack, which occurred near Mevo Dotan, left two additional soldiers wounded, one of whom is fighting for his life. Deus, an eldest child, is survived by his parents and two sisters. His father's uncle, Yisrael Deus, was killed while fighting near the Suez Canal during the 1973 Yom Kippur War. Deus served in the Home Front Command's rescue unit, and is the unit's first soldier to fall during operational activities. Kahalani is survived by his parents, Naomi and Dani, and four brothers. One of his brothers is currently serving in the Golani Brigade. Kahalani's funeral will take place at 11:00p.m. on Saturday evening, at the cemetery in Eliakim. Kahalani's father angrily demanded that the terrorist who killed his son be sentenced to death. "We need the death penalty," he said. "It does not help to destroy homes, and it does not help to feed them on the State's bill. We need to throw his family into the sea. If no decision is made, this will continue. It's time to put and end to this. I don't know if I should send my youngest son to the army, or if he should stay home with me. Initial investigations show that the soldiers were standing next to a pillbox, between an olive grove and the Palestinian Authority Arab town of Ya'bad, near Mevo Dotan. Deus and Kahalani were standing in the path of the car when it veered toward them, and the two soldiers who were injured were standing on the side of the road. The terrorist noticed the soldiers, veered off the road, accelerated, and hit the commander and the soldier who was with him. The IDF is currently operating near the Arab town of Barta'a in northern Samaria, where the terrorist, Alaa Kabaha, is from. Investigation by the Israel Security Agency (Shabak) showed that Kabaha intentionally rammed into the soldiers, motivated by "nationalistic" reasons. Kabaha's brother was arrested, and is currently being investigated for possible cooperation in the attack. Shabak emphasized that there are no other suspects, and Kabaha was not working under the auspices of any official terrorist organization. Meanwhile, staff at Petah Tikva's Beilinson Hospital are fighting for the life of the severely wounded soldier, who suffered injuries to his head and limbs. He is currently unconscious and breathing with assistance. Though he is still in danger, his condition has stabilized somewhat. The other injured soldier is in moderate condition, with injuries to his limbs.